Dog Head Falls is a dangerous waterfall in Johnson. 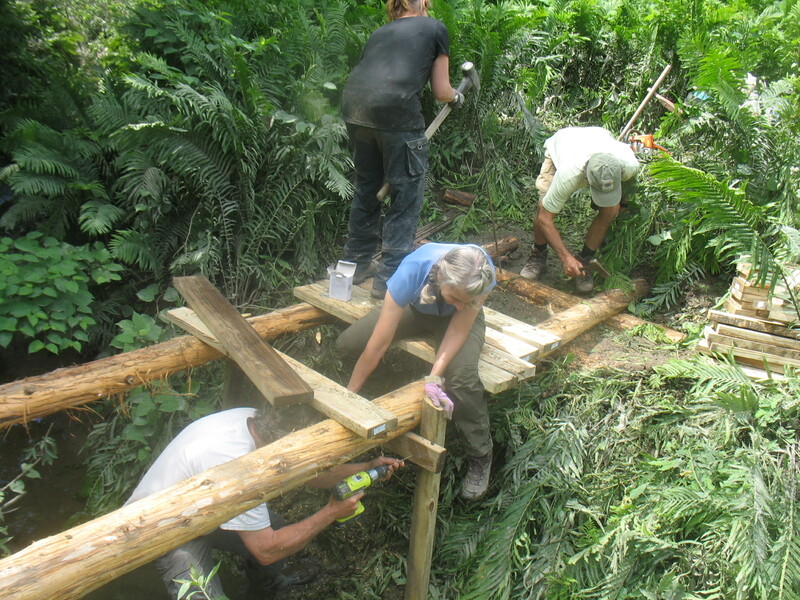 We worked with a private landowner and the state of Vermont to develop and maintain a portage trail around the falls to increase safety for river users. The portage trail was constructed by VRC staff, interns from Johnson State College, and community volunteers, with materials donated by Johnson Farm and Garden. Thanks to all those who contributed! 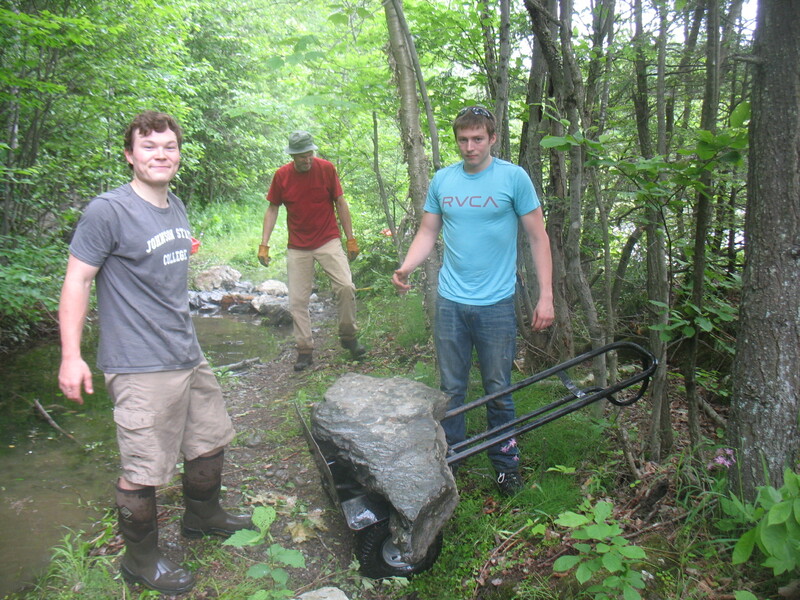 Funded by the Green Mountain Fund. June 2016. Sloping Falls is another dangerous waterfall in Johnson. We secured permission from a private landowner to developed a portage trail around the falls to increase safety for river users. 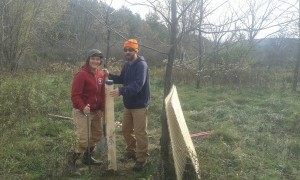 Students from Johnson State College, as well as community volunteers, helped with the project. The route begins at an eddy above the “lead-in” rapids, 100 yards upstream of the falls. It connects to old old road bed adjacent to the falls. 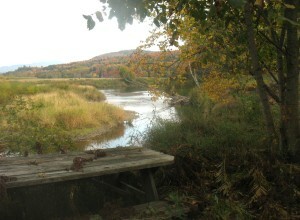 The put-in is an informal, sandy access 100 yards below the falls. 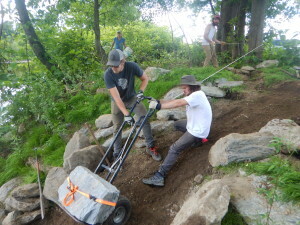 Paddlers also have the option to portage both Dog Head and Sloping Falls at the same time by walking along paths that now connect to the Lamoille Valley Rail Trail.Funded by the Green Mountain Fund. June 2016. Volunteers joined together to construct a new campsite along the Lamoille River in Johnson. 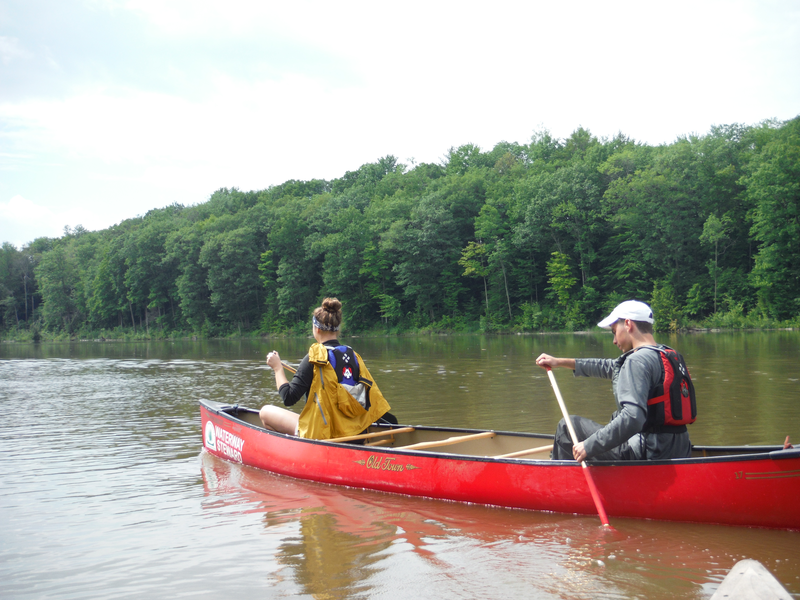 Named after a teeter totter found at the site, it is the first official campsite for paddlers along the river. Volunteers clearing tenting areas, installing a box privy, installed a picnic table, and added signage and fencing to limit ecological impacts. 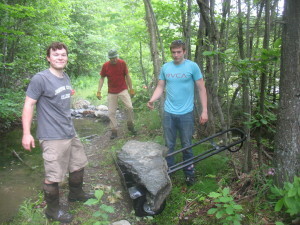 Funded by the Green Mountain Fund. August 2016. 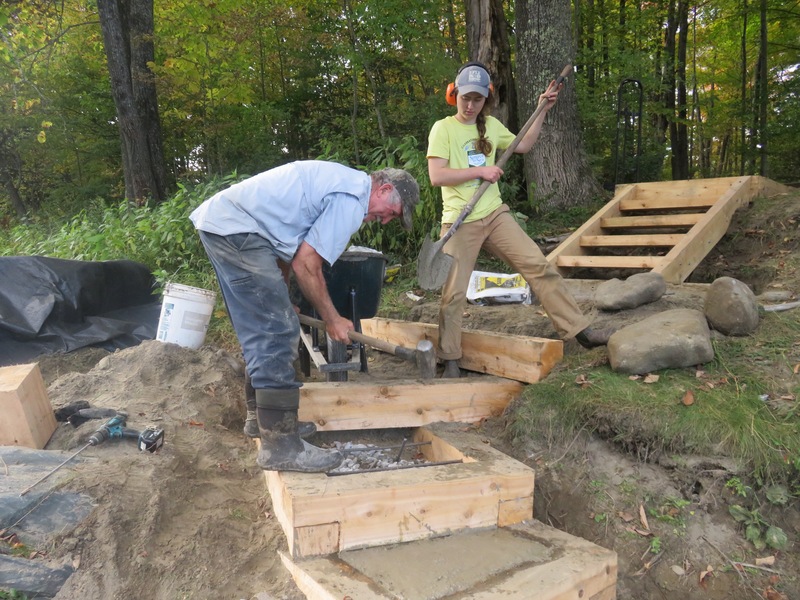 Northern Forest Canoe Trail interns and the town of Johnson, with the generous permission of a local landowner, built a new access below Sloping Falls in Johnson, Vermont. 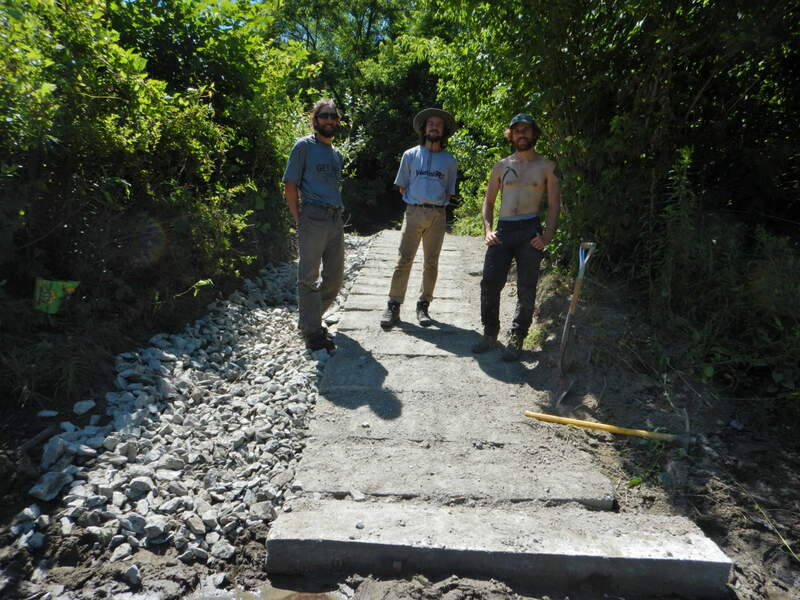 Paddlers and anglers will find a 4′ wide by 35′ concrete ramp. 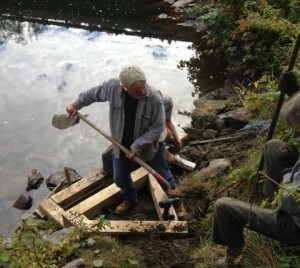 Timber weirs and erosion control stone have been added to address stormwater run-off at the site. Funded by the Lake Champlain Basin Program and the Kelsey Trust. July 2017. With permission from the local landowners, community volunteers and members of the Northern Forest Canoe Trail Water Trail Crew cleared and marked a portage trail around the Hardwick Lake Dam (river right) – an alternative to bushwacking through wetlands and over a 6′ concrete dam that was the former route! 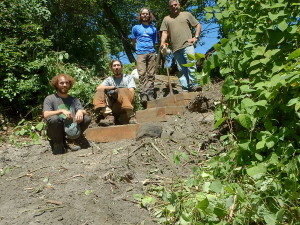 A cedar landing greets paddlers at the takeout, and a set of cribbed stairs facilitates access below. Funded by contributions from Susan Houston and Bill Bartlett. July 2017. 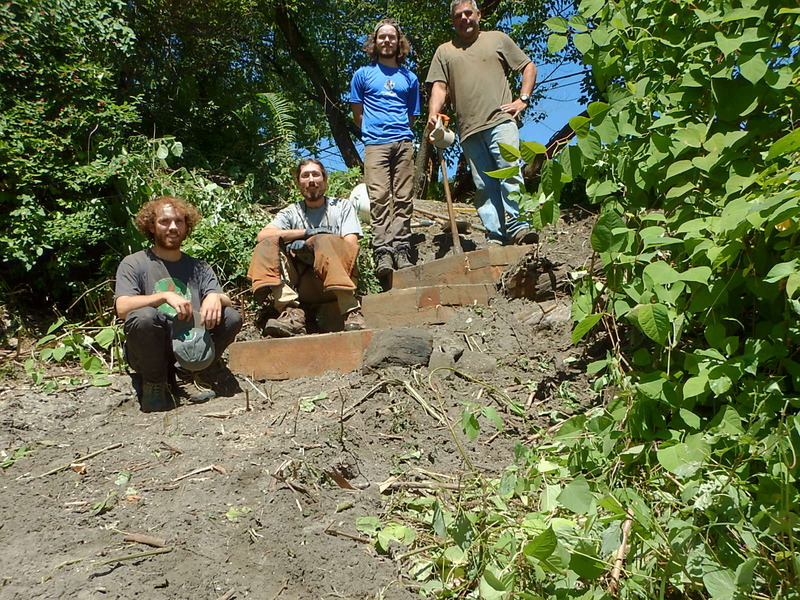 Community members and Northern Forest Canoe Trail interns transformed a steeply eroding, knotweed infested bank into a beautiful stone staircase. After stabilizing the site with erosion control techniques, the area was replanted with native species. Thanks to the Town of Morristown for providing heavy equipment support and donating rock, and the Lamoille County Conservation District for organizing the plantings! 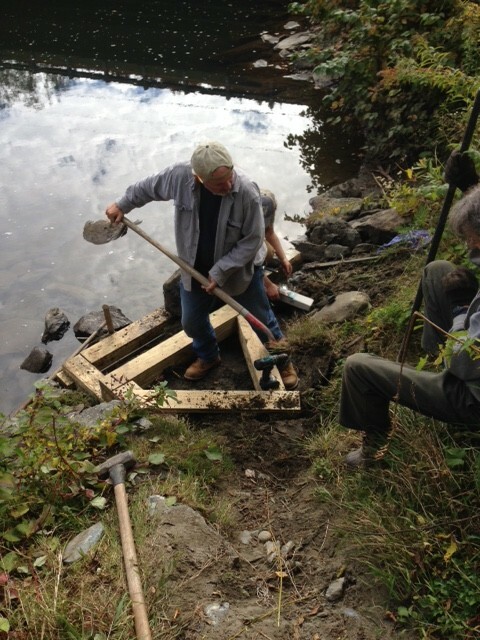 Funded by the Lake Champlain Basin Program, an ACA LL-Bean CFS grant, and the Morrisville Rotary. June 2017.